Big Boy Blue here we come…. In the last week Baby Blue has decided he doesn’t want to be a baby anymore. He takes his bottles only at nap time and wants a sippy cup or a big boy cup the rest of the time. He has veto-ed his crib. He wants to sleep on the trundle bed with his puppy. He’s so good though, he doesn’t get up at all. Just sits up, finds his bottle and goes right back to sleep. He has also decided that he wants to sit at the table to eat. Today he climbed up and is happy as can be eating the fruit loops that were sitting there. I gave him some string cheese and he’s happily munching away. Where did my baby go??? I have to admit I’m relieved in some ways. I know having another baby is going to be a hard transition and some of the things I was worried about, he’s solving on his own. I was worried he’d be jealous about the bottles or that he wouldn’t sleep on a big bed and we’d end up with two cribs. If he wants to transition on his own, by the time six months comes around he’ll be used to the big boy stuff. The only thing he hasn’t transitioned without my help is potty training, and we haven’t tried that yet. But he does love to pull his own pants off, so maybe we’ll give it a shot soon. 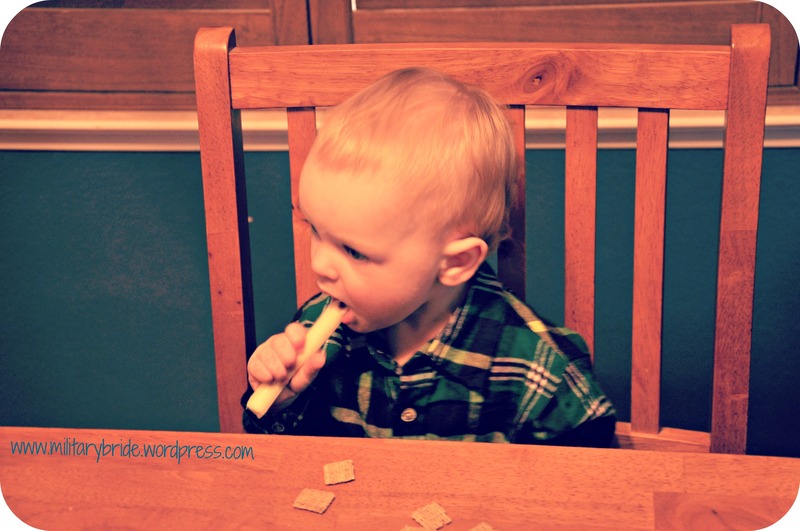 Posted in Baby, blogging, boys, family, life, Life Lessons, military family, Parenting, Uncategorized and tagged babies, baby, baby boy, child, family, kids, life, military family, military life, potty training, sippy cups, son, toddler beds. Bookmark the permalink.